Make Money Blogging – is an interesting topic to discuss. It’s because starting a blog is one thing and making money from a blog is another thing. Many people start a blog with a view of making huge amount of money from the blog, but not everyone succeeds in earning money with blogging. In my previous article, I have already covered how to start a professional WordPress blog which is a great foundation for the idea of making money blogging but I understand that I need to answer this question as well – How to make money blogging? How pro bloggers make money from a blog? Can I start writing a blog and make money? How to make money with a WordPress blog? Well, the list of questions related to making money with a blog is endless. But summing it up, I can say that most people are concerned about the various legit ways to make money with a blog and how to make money blogging like professional bloggers. So, in this blog post, I’m going to answer all your questions about how to monetize a blog. I’ll also share various ways professional bloggers make money blogging. I have tried many of these methods to make money from my blogs and I hope you can also try these methods to make money from your blog. So if you are a complete beginner who just started blogging and wants to learn how to make money with a blog, keep reading this. And even if you are an intermediate blogger who wants to increase your blog revenue, this is a good time to learn various other ways to make money with your blog. How Much Money Can You Make using Banner Ads? How much Money can you Make using Affiliate Marketing? How much Money can you Make Selling Online Courses on your Blog? How much Money can you Make Selling eBooks on your Blog? How much Money can You Make writing Sponsored Reviews on your Blog? How much Money can you Make Selling Your Own Services on your Blog? Are you looking for the top ways to earn money from a blog? You are in the right place because here you’ll find various proven ways to earn money online with a blog. You can use blogging to earn money online simply by writing articles on your blog. You can work from the comfort of your home, choose your own timing to work, and most importantly, there is no limit how much money can you earn with blogging. But before that, a quick disclaimer: Making money from a blog is not a “get rich quick scheme”. It takes some time to earn money from a blog depending upon how much efforts you are putting and how hard/smart you are working. 2) Non-AdSense bloggers who earn using other methods to make money from a blog. If you don’t know what is Google AdSense, let me tell you, Google Adsense is a Google-powered ad-serving platform which helps you to earn money from any blog. The process is simple. You may sign up for Google Adsense program, it’s FREE. After sign up you apply for ad-serving on your blog/website. Applying for ad-serving is basically requesting Google to show advertisements on your blog. Your bank account number and bank name etc. Your personal information like Address, Zip code or Pin code, country name etc. Once you submit your application, someone from Google manually reviews your blog and if your blog meets their quality criteria, they ask you to put some codes on your blog/website. If everything is alright, Google starts showing ads on your blog/website within 24-72 hours. You’ll also receive a confirmation email from Google informing you whether you are accepted or rejected. If rejected, Google will also provide detailed information about the reason for rejecting your blog. Work on that, and you can re-apply after making changes. However, if accepted, you can start making money with Google AdSense. Getting approval for Google AdSense is easy but earning money using Google AdSense is not – especially if you are doing it the wrong way. Let’s debunk each one of these one by one! In order to earn a good amount of money from Google AdSense, you need high-quality search traffic. When I say, high-quality search traffic, I mean, traffic coming from the search engine when a user searches for your target keyword. The quality of traffic may vary depending upon whether the searcher is male or female, which country he/she belongs to, what’s the search intent of user and many more other factors. Similarly, CPC or Cost Per Click is another crucial factor that decides how much you can earn using Google AdSense program. Cost Per Click is the amount that advertisers are paying Google to show their ads on your website for a certain keyword (search term). Higher the CPC, more will be the earning. Some keywords have high CPC (cost per click) while the others have low CPC. And sometimes, the same keyword can have high CPC in one country while low CPC in the other. The third crucial factor that decides how much you can earn money from a blog using Google AdSense is CTR (Click Through Rate) of ads. The Click Through Rate of an ad depends upon the way you place ads on your blog. If you place advertisements on more prominent places and above the fold, your ad will have a higher CTR while placing ads below the fold or in the less prominent areas of your blog will have less CTR. Finally, the fourth crucial factor that decides how much you can earn using Google AdSense is Page RPM (Page Revenue Per Mille). A Page RPM is decided by other crucial factors like CPC, Traffic, and CTR). It may vary from page to page and even the same page can have different RPM (Revenue Per Thousand views). When you are using Google Adsense to make money with a blog, your earning from blog depends upon many factors. But here I’m assuming that your blog is getting 10,000 page views per day with a page RPM of $20. Now, let’s do some calculation and calculate how much money you can make using Google AdSense on your blog. 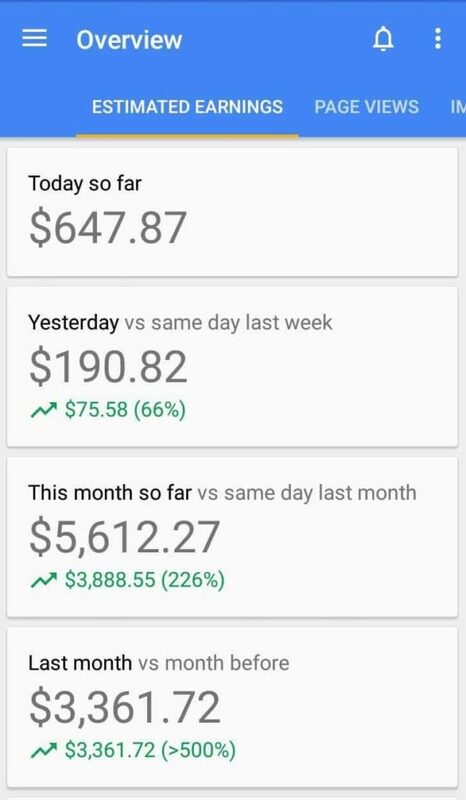 Total Earning (per month) = $200 x 30 = $6000 per month. Earning huge amount of money using Google Adsense is easy. How do I know it? It’s because I myself have done it consistently with my many blogs. If you want to learn how to start a profitable blog that makes passive income, you may sign up for a free 7-Days blogging course visiting this link. What’s one thing you notice common in every website you visit on the web? You’ll see one or two banner ads on most of the websites/blogs you visit. It’s because showing banner ads is a very popular way to earn money from a blog. Although not as popular as it used to be in the past, yet it’s still used as a primary method to generate revenue from a blog. Just like Google AdSense, there are many other popular ad-marketplaces which provide you with ads to show on your website/blog. However, there is one difference though – AdSense shows contextual ads meaning Google analyzes the context of your content and shows relevant ads based on your content topics and subject. However, on the other hand, other ad-marketplaces may/may not show contextual ads. They mainly show banner advertisements related to the category of your blog. For example, BuySellAds.com is one such biggest ad-marketplace where you can apply for banner advertisements. And once approved, you can set your charges for banner ads based upon CPM (Cost Per Mille, Cost Per Thousand). Mille is a Latin word which means thousand. While setting up the Cost Per Mille (CPM), you basically decide what amount you want to charge per thousand impressions of a banner ad. Now, let’s do some calculations to make an estimation of how much money this blog is making using banner ads. And, this is just from a single banner ad. You might have noticed that the blog is selling 4 banner ads with one of those being even more impressions. If you add up the earning from other ads as well, it’ll easily cross over $100,000 per month – all from blogging only. If you want to make serious money from a blog, you should start affiliate marketing today. I have already shared all the basics of affiliate marketing in my ebook “5 Simple Steps to Affiliate Sales Mastery”, you can grab it for free here. But here, I would like to briefly introduce you about Affiliate Marketing. Affiliate Marketing is the simplest way to make money from a blog (even without a blog). You recommend products to your friends and followers, and they purchase, you receive a commission – it’s as simple as that. The process of making money with a blog using affiliate marketing is simple. Almost every product has an affiliate program these days. First, you sign up for the affiliate program. After approval, they provide you with an affiliate link which consists of your tracking code. When users click your affiliate link and purchase a product using your affiliate link, you earn a commission. For example, I use LeadPages to collect leads and capture emails in my email marketing software – ConvertKit. Since I personally use and trust these, I promote these tools on my blog as well using my affiliate link. Here 1295131 in the URL is my tracking code. If any user clicks the above link and purchases LeadPages, I’ll earn a commission. There is no limit over the amount of money you can make using affiliate marketing. If you sign up for affiliate promotion on marketplaces like Amazon Associates and promote products, you can earn from 0.2% to 10% per sale. But there are some high ticket programs like ClickFunnels that offer up to 40% recurring commission. 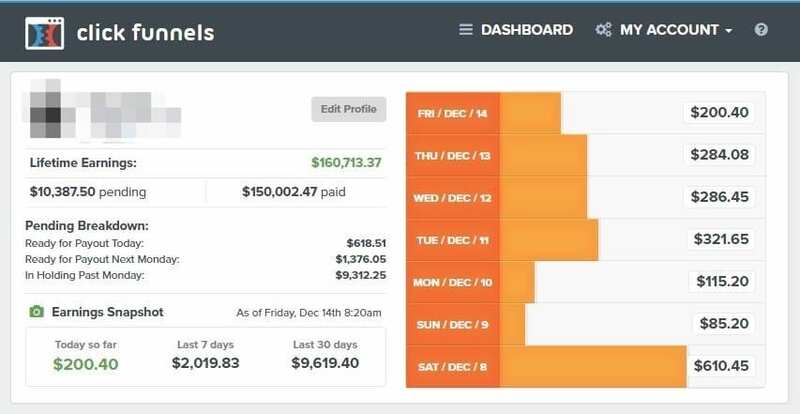 To calculate how much money you can make using this ClickFunnels affiliate program, watch this Affiliate Bootcamp. And this keeps on increasing. Because they pay you recurring commission. And this is just by promoting one product. There are many more similar products which you can find in my Affiliate Sales Mastery ebook. So I highly recommend you to read that for the advanced tips and strategies. If the idea of using affiliate marketing to make money blogging excites you, get ready for even more cash flow because creating and selling your own digital courses will help you earn even more huge profit. When using affiliate marketing to make money from a blog, your profit depends only on a percentage of commission you get for each sale (say 40%), but when selling your own digital product, you can keep all the 100% profit yourself. Digital Learning industry is blooming very quickly and is expected to cross over $325 Billion by 2025. It’s because with the concept of e-Learning becoming a new trend, more and more people are purchasing or enrolling themselves in online courses. And that’s totally acceptable because a recent study confirmed that digital courses may offer the maximum value to the money. When learning from digital courses, a learner is more likely to connect and communicate better with the teacher/coach and hence, pays more attention to the concept being taught. This brings us to a conclusion: Online courses are the future – not only because the e-learning industry is quickly becoming the most profitable industry, but also because you can offer the maximum value to your students and inspire them to transform their lives. Most people think that they need to be en expert in their subject in order to create and sell online courses, but the reality is different. If you have any personal experience about the subject and have gone through a transformation, you can easily succeed with creating and selling online courses. Have you ever been in a situation when your friend or your family member asked you, how did you do it? Say, you lost 30 pounds of your weight in 2 months, and everyone started asking you, how did you do it? And many more. You may think it yourself – what you already know. But the fact is: you can create an online course about anything you already know. Because everything is teachable. And these lines coming from a slogan by Teachable which allows you to create and sell your digital courses. I use Teachable to create and sell my own digital courses. Make huge money while providing the solution via the medium of your online course. Did you notice? I kept launching of an online course to #4. Most people do it wrong. They first create and launch courses and then start finding customers without even doing the market research about who will buy their courses. That’s why most people fail. But you won’t! Because I have already provided you much-needed information and secrets that very few people know. If you want to learn more about creating and selling profitable online courses, watch this tutorial. And this is a very small number, I know many bloggers who are making over $100,000 every month just by selling online courses. If you want to make money by selling online courses, watch this video training. Selling eBooks to make money with a blog is a very popular strategy that many professional bloggers use to earn money from their blog. It’s just like creating and selling online courses but limited to eBooks only, meaning the medium of selling your knowledge will be a text-based ebook. If the idea of creating digital courses and selling it seems a daunting task, you can start with small by creating and selling an eBook. Creating an eBook is easy, I have created myself. You can do as well. Simply create a document in MS Word, Pages on Mac, or even Google Doc on the web. Then turn the word document into a beautiful PDF and start selling it. When users visit the landing page, I ask for their email and in return, I send the eBook as a downloadable PDF to their email inbox. Though you can use LeadPages to charge users before delivering the eBook to their inbox – just in case you want to sell eBooks. But I offer my eBook for free. Now take my free ebook “Affiliate Sales Mastery” into consideration and do the calculation. I don’t charge any price for my eBook and offer it for free to my blog readers as a gift. It has been downloaded over 2000 times so far. Now think if you price it even higher or increase the number of sales. Do your calculations, and start selling eBooks on your blog because it’s a highly profitable way to make money from blogging. If you don’t want to create your own eBook, you can start by promoting and selling others ebook as well. DotCom Secrets and Expert Secrets are excellent books to start with because these are the books that can transform the life of any reader. Do you know how Xiaomi acquired the largest smartphone market share in India within just a few years? It utilised its marketing budget right. Xiaomi approached many bloggers, influencers, and celebs to pay them a hefty sum of money in exchange for its smartphone and other products reviews. This worked so well for them that soon Xiaomi not only became a popular smartphone brand in the Indian market but also acquired the largest market share. Why? It’s because review articles or videos by bloggers, YouTubers, Insta famous, and celebs, etc. are very influential. These marketing trends are so effective that brands are always looking to spend their marketing budget on sponsored reviews. That’s why making money with sponsored reviews is always a good option to make money from your blog. If you can write a good quality review content on your blog and your blog has some influence, you can start making money using sponsored review on your blog. Either you approach the brands or you let the brands approach to you. If you have a popular blog and good following or influence, brands will approach you; however, if not, I highly recommend the first option. If your blog post gets more exposure and generates sales for them, the brands will approach you again and again. The more brands approach you, more chances to create sponsored content. The amount of money you can make writing sponsored reviews on your blog depends upon what authority you have or how much popular your blog is. The higher the authority and popularity, the more you’ll get paid per review post. Well, this is just one example with an average of $250 per sponsored post. In the past, I have done many sponsored deals up to $1300. But that’s my limit only. You have no limits, you can go even beyond that. I know many tech bloggers who charge up to $4000 per sponsored review on their blogs. Do you offer any of the online services? If yes, you can sell your own services to make money from your blog. For example, say you have a photography niche blog and you provide photo editing services. You can easily make money blogging by selling your services using your blog. Simply write blog posts with tips-tricks, and how-to tutorials, bring visitors on your blog, impress them with your skills, and provide your services as a solution. And many more – depending upon your skills and blogging niche. That’s why it’s important to choose a perfect blogging niche. It’s worth noting that, in this entire process capturing emails of your leads/prospects is the most crucial step. Because 97% of visitors who leave your site will never return. So, you need to have a proper system in place so that you can sell easily without much hassle. If you want to learn how to generate more leads and sales in simple steps, watch this free training. Maybe $100 per month or maybe $100,000 per month. The amount of money you can earn by selling your own services on your blog varies depending upon what you charge and how many clients you have. Some people charge hourly rates, some charge per day, while other charge per month. However, if your services are great and you are an authority figure in your industry, you can charge even more. For example, brands like Zomato, Swiggy, etc. hiring SEO consultants for up to $30,000 per month. But every field is different, this is just an example. Do your market research and set your price or charges depending upon your expertise level and what’s effective for your market. That’s how you can make money selling your services using your blog. So these are some proven ways professional blogger make money blogging. When you are a newbie blogger, my recommendation would be: start with Google AdSense because almost any blog can be monetized using Google AdSense. And once your blog grows a bit, integrate other methods like affiliate marketing which is a great way to add up to your total blog revenue. And once you feel that showing ads on your blog is not worth it, you can completely remove ads and focus on money making methods for the blog that pay huge like affiliate marketing, selling ebooks, or digital courses, etc. But don’t try all these methods at once. Try one way to make money with a blog and stick to that method for some time. Switch to next method if one isn’t working for you or you want to scale it up. 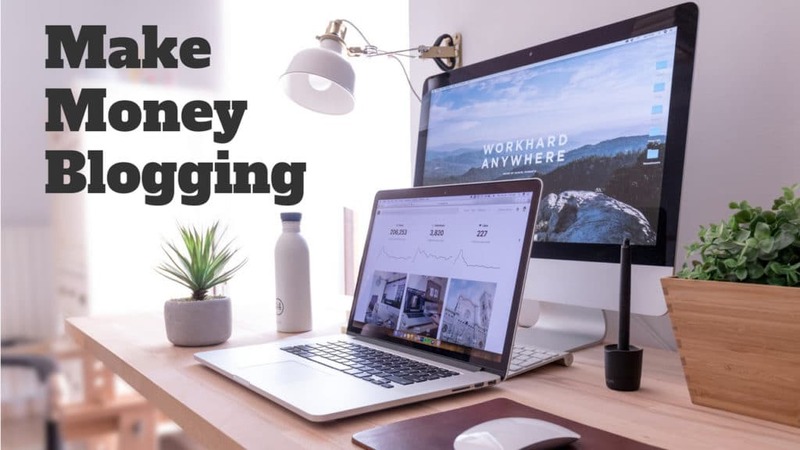 I hope this article helped you learn how to make money from a blog and now I have answered all questions regarding making money blogging. However, if you have still any doubts, let me know in the comments below. I’ll try my best to help. If you enjoyed reading this blog post, please share it with your friends so that they may also learn.